Adele Henderson is a painter and printmaker that comments on multiple issues such as environmental, sexism, one percent, and most recently: perception of risk, terrorism/disaster preparedness, living life in the moment, and ‘extended forecast’. She received her B.F.A from the University of Nebraska – Lincoln, and MFA from Arizona State University. 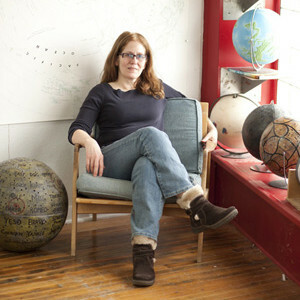 She joined the University at Buffalo (State University of New York) Department of Art (now Visual Studies) in 1987, served as department chair from 1998-2004, and is currently the Director of Graduate Studies. Major awards include a National Endowment for the Arts Fellowship; Fellowship (Printmaking); Artists Projects: New York State Regional Initiative grant; and residency fellowships at MacDowell, Yaddo, Brandywine, Roswell Museum and Art Center, and Open Studio (Toronto). Henderson’s artwork has been exhibited in over 30 solo exhibitions across the US including the Hewlitt Gallery at Carnegie Mellon, Anchor Graphics, Colgate University, and the Print Center, Philadelphia, and in over 150 group exhibitions countries including Australia, Finland, Japan, New Zealand, and Slovenia. Her prints and works on paper are in the collections of the Boston Museum Of Fine Arts; Fogg Art Museum, Harvard University; Albright-Knox Art Gallery; Nelson-Atkins Museum Of Art; National Museum Of American Art; New York Public Library; the Kennedy Museum of American Art, and the Sheldon Memorial Art Gallery, among others.